#177 29th Oct 2008 at 3:44 AM Last edited by aelflaed : 29th Oct 2008 at 3:50 AM. I've been using this rack for a while without issue, but a couple of days ago, it struck a problem. I began playing a particular house containing the rack, and had a jump bug whenever I clicked on a sim to give them a command. I hadn't played that house for a while, but had played normally the previous day. Didn't alter any CC between the sessions, just chose a different house. error log posted. I decided to delete a Vitasims spice rack which I thought was meant by the 'kitchen utensils' reference. That did seem to fix it, and placing a new spicerack didn't make the problem recur. I thought you might want to check it out anyway. Edit - just noticed my version is an old one, I'll update it. Wow you did a total bypass of the interest limits so that it remains unnecessary to increase the pie menu? Very impressive! So theoretically, a Sim could max all interests? (Not that you would want to as that would be a very boring Sim). I wanted you to know that this rack works wonderfully with Pescado's Macrotastics. 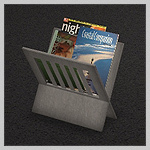 Sims told to clean the house will use this magazine rack to store any magazines they find while doing their chores. I thought Macrotastics would ignore it like it does most custom objects or just put books away, but the 2 work great together. I'm glad you fixed the bug too. I thought that the errors were my fault since I was trying to change some things in SimPE. I miss Inge's Sensible Study bookcase since it has never been updated for FT or AL, So I'm taking my copy of your magazine rack and adding some motives so I can have Sims study autonomously again. I wish there were more 'types' to advertise to though. Is there any way to advertise to interests or aspirations? I noticed that in "Show pictures to youngster" and "Be Shown the Pictures" you advertised both fun and a category that SimPE has labeled 'unused'. Did filling in that 'unused' line allow you to advertise to outgoing Sims (type 0009 on the unused line) AND/OR serious Sims (type 0008 on the fun line)? If so, is it AND or OR? Since that line is unlabeled, what is it advertising? I also see in the magazine file 'read magazine' is advertised to type 0019. The chart I have stops at type 0016 so I was wondering where the info is located on motive types >16. So if you know of a better chart or tutorial that addresses motives, I would appreciate you pointing me in the right direction. Thanks, Numenor! I`ve been using your "old" magazine rack for a while now. Just curious if it is possible to have both in game. I`m guessing not. MagicMoon - I got rid of the code that decresed a random interest when the total interest was greater that a given limit; therefore, sims can now maximize all their interests (it would take a while...). BTW, I don't consider this "cheating"; after all, in real life, we can have a great interest in many subjects at the same time! As for the advertise system, in the TTAB, there is no way (known to me) to set a "delta" advertisement for specific interests or aspirations. I'm quite sure that it is possible, on the other hand, change the advertisements via BHAV, and this allows implementing any possible check. Don't ask me how this works because I don't know; it's basically an intuition. The various advertisements are considered in an "OR" relationship; the interaction attracts a sim that is in need of fun OR in need of... "unused" (of course, the "unused" motive is unused, but if it was e.g. "hunger", the rack would attract a sim when he is either bored OR hungry). thanks for fixing that Numenor, I'll get the latest version. Ah, Numenor, the file name matching would not be an issue to having both in the Downloads directory, as I use the downloaded archives` filenames [amongst other criteria] to subfolder Downloads, and as your archive has a different MTS2 ID number, the downloaded archive also has a different file name, thus your new magazine rack goes into a different folder, and I would have both in Downloads if I hadn`t already deleted the old one. Now, I think I know what happens if it encounters two possibly different packages with matching GUIDs, but what does the game do if it finds two [or more] packages with the same name, but possibly different contents, in two different directories? If they have different GUIDs, I would think it would use both, and if they have matching GUIDs, use the one in the alphabeticaly-highest directory. Si? Nyet? 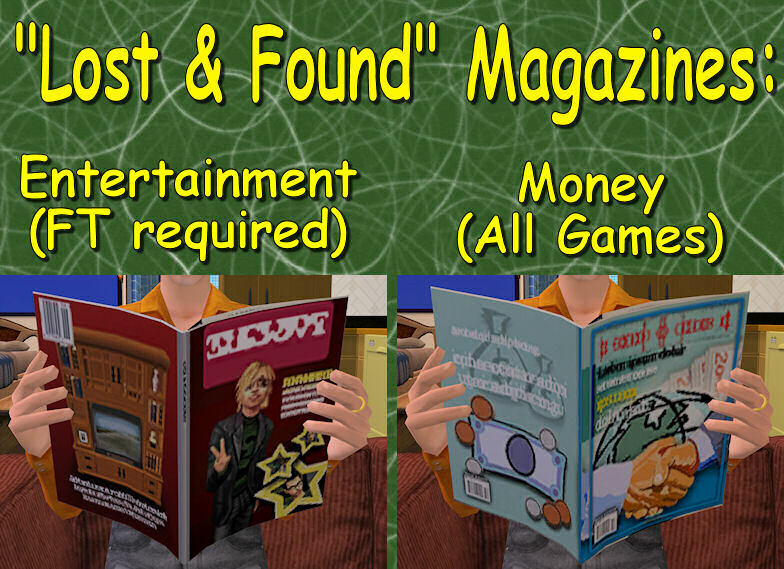 If I am right, my game would have automagically used the new magazine rack, even if I hadn`t deleted the old. Do you know how multi-level subfoldering affects presidence? If I remember well, in a multi-level Downloads folder, the game reads the single packages, first (i.e. the packages in the root), then the subfolders in alphabetical order; the same applies to the subfolders: packages first, then sub-subfolders in alphabetical order, etc. Two different packages with identical filenames are considered different objects, and can co-exist in the game with no problem; the only piece of data used by the game to classify custom content is the GUID. Even if there are "rules of precedence", I see no reason why keeping two objects with the same GUID installed at the same time: if you are clever/lucky, the older one will be ignored; if you are unlucky, the new one will be ignored. What triggered this question was you mentioning that the file still had the same name as part of why I couldn`t have both; since the archive has a different MTS2 ID, and I use the archive name, which contains the ID, as part of the directory structure, I can have both files, just not both objects. Because of the way I subfolder, the precidence rules you outlined, and the way this site names downloaded archives, my system would have used the new version, unless the number of digits in the download`s ID number had increased, which they didn`t. As I had already deleted the old version before posting the question, this isn`t an issue, but I greatly appreciate the information. Thank you. I've made the changes to make everything on the rack autonomous and am happy with the results. I know that there must be a way to copy the private tree table to the other rack, but I can't figure it out. I see 'extract' and 'clone' as options. Could you tell me how? I've been searching the SimPE site for an hour and am just going in circles. Thank you. #187 5th Nov 2008 at 6:40 PM Last edited by Numenor : 11th Nov 2008 at 9:22 AM. 'Extract' is what you need; extract the modified TTAB, then open the other package, right-click on the existing TTAB and choose 'Replace'. When the file selector open up, be sure to choose the ".simpe" file, NOT the XML! - (don't remember, lol! something related to logic, I guess) EDIT: it should be the "logic" book you can study when you gain the special bookcase as career prize in Seasons. EDIT: they are the special "Study... (Charisma, Body, Logic, Creativity)" interactions only available when you gain the special bookcase as career prize in Seasons. The only thing I changed was the TTAB, adding motives and enabling autonomy, but I have this irritating error. Whenever it occurs it "eats" one of the Custom written novels on the lot. "Reference to tree table entry that does not exist". 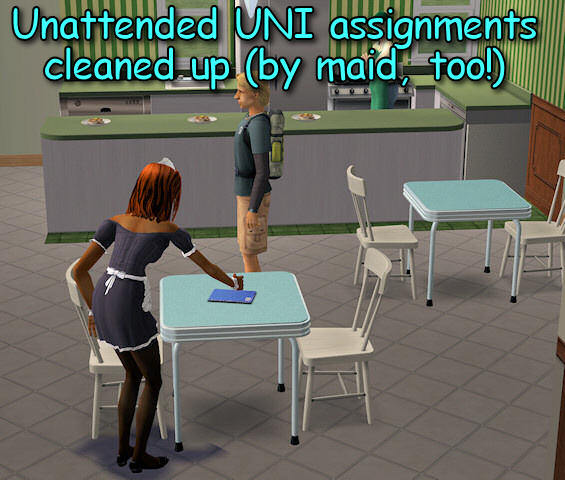 The error occurred when the Sim tried to study Cleaning which she and other Sims have done numerous times before without problems. If I caused this problem, I apologize for wasting your time. - According to the log, when the error occurred the sim "Golden" was trying to perform the interaction "Read book.../Cuisine" (meaning the FreeTime cuisine magazine), and the game couldn't find it in the TTAB (but it *does* exist in my original package). But have you said that your sim was trying to read a custom novel? - In any case, please double check *your* modified interaction 0x0E (14) "Read Book.../Cuisine", comparing it to my original one, to see if you didn't break something unkowingly. - A test thet you can easily run is to save the game, direct your sim to perform the faulty animation and wait for the error; then exit without saving, replace your modified packages with my original ones, and restart the game; immediately direct the sim to perform the same interaction, and see if the error occurs or not. I looked and compared, yet cannot find anything I did wrong. I can't even force the error to happen! It *appears* to happen randomly. I clicked on everything in the rack without errors, yet this error occasionally occurs. Read book> cuisine is available and works fine when clicked on. I tried my best to solve this, so I will take you up on your kind offer to look over what I did. ETA: The error is occuring on different books, but only when autonomous. Each time it deletes a novel. But I found out that if I leave the lot without saving, I will still have my novel. #191 11th Nov 2008 at 9:17 AM Last edited by Numenor : 11th Nov 2008 at 9:27 AM. Thanks, I downloaded the files; I will look into them. EDIT: my first, incomplete finding is that when the error occurs, your sim are trying to study something spontaneously, and they are supposed to have in their hand the standard "study" book; but they actually have the novel in their hand, instead. When the game tries to start the "Study" interaction using the novel (that does NOT have the Study interaction), the error occurs. Now, I have to understand WHY the sims have the wrong book in their hand, and why this does NOT happen when the interaction in user-directed (not autonomous). I just got the error when I directed a Sim to study cooking. So the error can occur when user directed. The log doesn't *appear* to be different from the others so I won't upload it unless you ask for it. Yes, please, upload it. The last "frame" may be identical to the others, but the "history" of the previous BHAVs executed (and the parameters passed) is different. PS: have you tried swapping the packages in the Downloads, after the error occurred? #194 11th Nov 2008 at 8:53 PM Last edited by magicmoon : 11th Nov 2008 at 10:59 PM. Had to get some sleep, but that is today's plan. I'm swapping them out now to see if I can still get the error. ETA: The 2nd error is from your unmodified rack. #196 12th Nov 2008 at 9:46 AM Last edited by magicmoon : 12th Nov 2008 at 11:46 AM. I just got that error on a regular bookcase, so there is probably something wrong with my game rather than the rack. I'm testing now to see if I can pinpoint what is causing it. I just wish the error was more consistent. It sure would be easier to find the cause. ETA: Somehow the error seems connected to the Sim. The last time I saved was before Allen threw the error. On reloads, no matter which Sim I use, the error will only be thrown by Allen and will occur the very next time he tries to study. This last error is after removing all custom content. This caused a reset and Allen was standing in the front yard instead of at work where I left him. Yet when I directed him to study, he still threw the error. MagicMoon - Thanks for your useful reports. The thing becomes more and more strange every day, but here is what I think (I need you to confirm some circumstances). - The sim is directed (or autonomously decides) to study; the subject is irrelevant. - The game scans the lot for existing novels; when one is found, the game checks the "relationship" between it and the sim, excluding the novels that have no relationship (or a weak relationship) with the sim. In other words, if I understand well, the game possibly checks if the sim is the author of the novel. 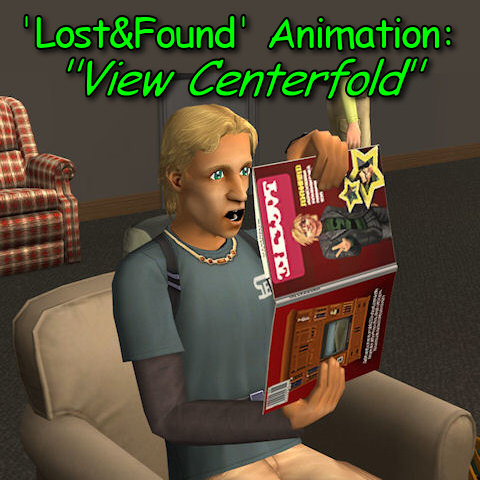 - If a valid novel (related to the sim) is found, then the game puts that novel in the sim's hand. If no valid novel is found, a standard book is created instead. - The sim is then forced to perform one of the "Study" interaction from the book that he has in his hand: this is where the error occurs, because sometimes the sim has a standard book in his hand (that can be studies), but sometimes he has the novel, that can't be studied ("Reference to tree table entry that does not exist"). Question 1 - I see from the log that there are TWO novels in the lot; at least ONE of them has been written by Allen Hines? In your previous logs, the sim "Golden" was causing the errors; back then, did you have at least one novel written by Golden? Question 2 - You say that the error is not consistent, but think of this: by chance, do Allen and Golden (and only them) always suffer from this error, and not the other sims? Or better: does the error only occurs when the "study" interaction is performed by a sim that has written a novel? Thank you so much for helping me work out this odd problem. In the earliest logs, only Golden had written any novels and only she was getting the errors. The most recent novel was written by Allen Hines. Golden is not currently being affected by the error, only Allen Hines although she still has novels in the bookcase. For now, it appears that ONLY Sims who have written a novel are affected, but not ALWAYS affected. I will attempt to pinpoint it. Just before I saved, Golden finished another novel. I will go back and see if she, Allen Hines, or both are getting the error now. I'll also check to see who, if any, gets the error when some novels are deleted. Several Sims have novels in progress, so I can do some experimenting now that I know what to look for. Oh, when I say 'inconsistent'...I'm in the computer repair business and know that there is no such thing as random errors. I just mean that it appears inconsistent because I have been unable to find the pattern that causes the error to occur. BTW, why would the game run a check to determine a Sim's relationship to a novel? I can't think of an example where the answer to the check would make a difference. When I went back into my game there were 3 novels, all by Golden (I guess I lost Allen Hine's novel in testing). While testing I always exit without saving so that I'm always at the same starting point. I am using the Maxis Cinderblock bookcase for testing. Allen Hines was determined that it was his turn to throw the error. No one else would error, but he would error the first time he tried to study. So I took note of which novel was being deleted. It was the same novel every time. So I had him read that novel and then study (He only needed to read long enough to open the book). To my surprise the error did not occur! I did 8 more reloads. Every time he read the novel first, no error occurred when he studied. But if he tried to study first, the error would occur. I made sure that the novel was back on the shelf and available to read before telling him to study each time. I also tried having him read the other novels before trying to study, but the error still occurred. The only thing that stopped the error was having him read that one particular novel first. If I bypass the error by reading the novel first, or if I let the error happen so that the novel gets deleted, the errors stop and none of the Sims error after that. After the tests, I had Allen Hines read the novel so all 4 Sims living on the lot could study with without errors. Then I had a third Sim finish a novel and placed it in the bookcase and saved the game. But now I can't get any Sim to throw the error whether that last novel has been read or not. My testing continues. I hope this helps. I, too, have run a lot of tests, with multiple novels created by multiple sims, using your modified magazine rack and mine, sending sims to study or waiting for a spontaneous interaction, and I had not a single error. Though I still don't understand fully the BHAV that I've examined in my previous post, I can't help but notice that the game knows quite well whether it should put in the sim's hand a novel or a normal book, and never failed in my game. I start to think that for an unknown reason that specific novel of yours had a temporary problem, that was fixed when your sim has read it. At this point, please go on playing normally, and tell me if the error occurs again.